Cutrim Schmid, E., & Whyte, S. (Eds.) 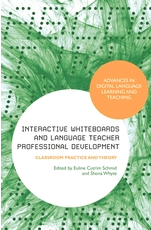 Teaching languages with technology: communicative approaches to interactive whiteboard use. A resource book for teacher development. Advances in Digital Language Learning and Teaching (Series editors: Michael Thomas, Mark Warschauer & Mark Peterson). Bloomsbury. Interactive Whiteboards: against the odds?